I love the way Jeremy Olsen paints strange and surreal worlds where the light is ominously glowing from within internal organ like structures. I could be looking inside something or from within it. I find his paintings luminous and captivating. 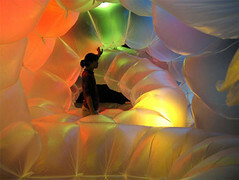 Artist Shih Chieh Huang does similiar work in 3D. Check out his site. Also, if you know of any babies or kids that need fabulous clothing my favorite children’s clothing company is having a big sale this weekend (it’s my parent’s clothing co. my mom designs everything!). Here’s the flier.